﻿Bruce Goodman's "An insidious thing"
Diana won first place at the local agricultural show for her pansies in a pot. The citation citated: First place goes to Diana for her pansies in a pot in the Pansies in a Pot section of the Potted Plants Section of the Flower Section of the Gardening Section of the Agricultural Show. When she walked along the street Diana knew that people were looking at her. Jealousy is an insidious thing. She could feel their spite as they stared. They were talking about her behind her back in a disparaging and offensive manner. 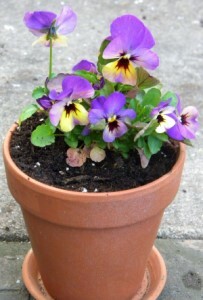 “When she went into a plant shop she always asked if they had any pansies in a pot. She didn’t want to buy any, of course. She was simply using it as an opener to tell the shop keeper of her stunning triumph. The shop keepers declared each time that they had never even heard of such an award – let alone the winner. Jealousy is an insidious thing, oh yes, is it not? said Diana.